In 1968, The Monkees toured Australia and Japan. 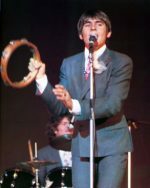 These concerts were hugely successful despite the fact Monkeemania was waning in the US and the UK. Their movie Head had yet to be released and would be seen by many as the groups suicide note to the world, although it’s more likely Bob Rafelson’s murder confession. In the Far East The Monkees were kings. The video however has never surfaced. It is the Holy Grail amongst Monkees collectors. I’m not 100% sure that it was even broadcast on television. My mission is to find out 2 things – firstly, was this concert actually broadcast on Japanese television and secondly, where the bloody hell is it now? If you can help in any way whatsoever, please email iain@iainlee.com. Honestly, no nugget of information is too small. Did you see it? Did your parents see it? Have you ever been in the vaults of a Japanese TV station and seen a mysteriously labelled videocassette with the words The Monkees on? Did you tape this off your television? Anything you can provide will help as I strive to bring this lost treasure to the world of Monkees fans. A big thanks to the fab www.MonkeesLiveAlmanac.com for pics and facts. I’ve been keen to find out about this too. I heard a story that the video/film tapes were lost in fire at the tv station building. Too be honest, too much b&@*hit and urban myth. Time for hard facts! There HAS to be some Japanese Monkees fans with some real info!?! Used to love the tv series every week! I was brought up in loving them because my mum listened to them. Just miss all of them in their tv show!